The Human Torches of Tibet is an important piece of journalism, and we (Tibet Society) were glad to see the BBC broadcasting the 24-minute documentary on BBC World. However, it is ashame the BBC has not seen fit to find a place for it on one of its mainstream channels in the UK except for a five-minute condensed version on Newsnight. (For those outside the UK, the viewing figures for the BBC News channel are considerably smaller than those of BBC1 or BBC2). The documentary is important as it highlights an issue which receives only sporadic attention from the media – namely the ongoing protests in Tibet. The average person in the street is unlikely to have heard of the self-immolations in Tibet, nor the tens of thousands of Tibetans who have taken to the streets this year to protest against the Chinese government’s continuing repressive policies. Although we applaud and welcome the documentary we have several misgivings. For one, it was disappointing the angle taken was that of questioning the Dalai Lama’s non-violent policy. Surely the protests and self-immolations in Tibet and the reasons behind them are worthy enough of a documentary, without the need to question the policy of the Tibetan spiritual leader, who has now retired from politics? Our main concern from the programme was the implication that many exiled Tibetans are dissatisfied with the Dalai Lama and his policy of non-violence. At one point the presenter expressed her surprise that “so many [exiled Tibetans are] prepared to criticise their spiritual leader [the Dalai Lama]”. Yes, there is a strong debate in the Tibetan exiled community on the way forward, given that ten years of talks between the Chinese government and representatives of the Dalai Lama have yielded absolutely nothing and in the interim period the situation for Tibetans in Tibet has only deteriorated. However, it is somewhat disingenuous to say (or at least imply) that there is widespread disillusionment amongst exiled Tibetans with the Dalai Lama. 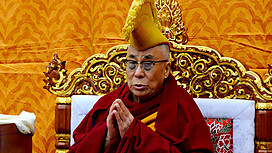 Tibetans for years have taken their lead, both spiritually and politically from the Dalai Lama. In the past, few Tibetans would openly voice their disagreement with the Middle Way Approach. However, now that the Dalai Lama has stepped aside politically, the Tibetan people, at least those in exile, have the opportunity to express their own opinions without fear of opposing the wishes of their spiritual leader. But this will take time. Old habits die hard, and many Tibetans still want to first hear what the Dalai Lama has to say. Those who made their views known publicly during the Dalai Lama’s political reign have now come to the fore, but they are not necessarily representative of the majority of the exiled community. It would have been interesting to hear more from the Kalon Tripa (Prime Minister), the first democratically elected political leader of the Tibetan people. Though the Dalai Lama’s opinion is important and newsworthy, surely that of the Kalon Tripa is what the world (and specifically China) needs to hear. Nonetheless, debate is healthy and the cornerstone for democracy. But we must give the exiled community time to find its voice and allow the Kalon Tripa, the exiled government and the community as a whole time to get used to the vagaries of public opinion. A point to note is the programme’s implication that Tibetans took the lead to protest from Westerners when it stated that in 2008 “as news of demonstrations (Olympic torch relay) reached the rooftop of the world, Tibetans rose up against their rulers”. In actualality the protests in Tibet began on 10 March 2008, whilst the first protests against the torch relay took place in London on 6 April 2008. The demonstrations and unrest (which continue to this day) was (and is) completely down to Tibetans in Tibet and their increasing frustration and resistance to China’s occupation and rule. These points aside, we hope this documentary can be repeated on BBC channels in the near future so it can receive as wide an audience as possible. In the meantime, we have uploaded it onto our Youtube channel, so you can watch it and share the link with your friends and colleagues. Click here to view the documentary on Tibet Society’s website. I am at a loss for words…speechless and sad. My thoughts and prayers go out to Tibetans all over the world but especially to those in Tibet.